Protecting your eyes starts with having routine eye exams. To help keep your eyes healthy and eyesight clear, sign up for the PrimeStar Select Vision insurance plan today! Vision is an important, yet often overlooked, aspect of your overall health. Just imagine how different life would be with limited or no vision. PrimeStar Individual Vision Insurance can help keep your eyes healthy while protecting your overall wellness, too. 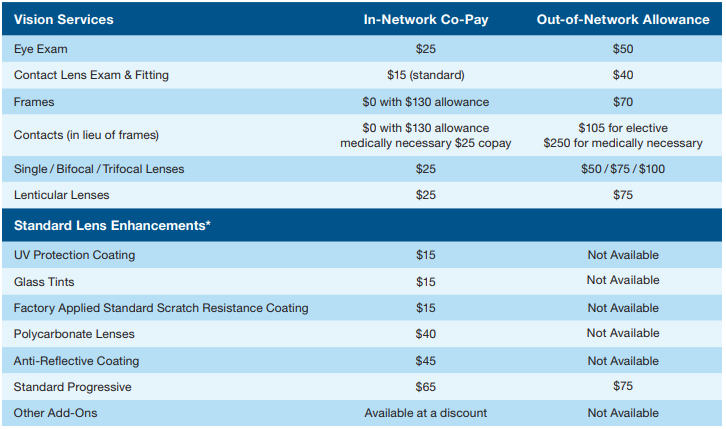 This is coverage that helps reduce the cost of routine eye needs to offering savings on major procedures. You get one eye exam a year, starting day one. 15% average off retail price for LASIK or PRK laser vision correction, or 5% off promotional price, at U.S. Laser Network locations. Please note that based on applicable laws, reduced costs may vary by doctor location. At EyeMed, everything they do is designed around their members. Naturally, they want to make it easy for you to use your benefits. Whether you are a tech-savvy consumer or someone who prefers a helpful voice on the other end of the line, they’re with you every step of the way. The Cost for an Individual is $10.67/month. When it is an Individual + One then the cost goes to $19.63. However, where the real savings is is in the family program. The family plan is for 3 or more and can include your children until the 26th birthday is a flat $29.34 per month. This means a family of 5 is getting their vision insurance for less than $6/person. Want to check on availability? Just click the image below and use the “SELECT” network to provider that is in the network. Please note that providers change so even if a provider is displayed, we recommend you call ahead to confirm the provider accepts your EyeMed plan. After you sign you can start using the network right away. Within 10 business days, you will receive your full policy and ID card. For the quickest access to providers, ID card, locations and more – download the EyeMed app today! To search for providers, go to eyemed.com and select the Select Network or call 866-289-0614. Of course there are some limitations. So what is not covered? Vision examinations, lenses and frames more than the frequency as indicated on the plan summary page. Orthoptics or vision training and any associated supplemental testing. Plano lenses (lenses with refractive correction of less than plus or minus .50 diopter) except as specifically allowed in the frames benefit section of the Plan Benefits. Two pairs of glasses in lieu of bifocals. Replacement of spectacle lenses, frames, and/or contact lenses furnished under this plan that are lost or damaged, except at the normal intervals when services are otherwise available. Medical or surgical treatment of the eyes. A service which is not listed under the Schedule of Eye Care Services found in the certificate. Members pay costs exceeding plan benefits. This plan not available in MA, MD, MT, NM, NY, RI, WA and the PA counties of Forest, Huntington, Montour and Sullivan. State variations of this plan may apply based on applicable state law(s). This is the highlights the of the described vision coverage available through Ameritas Life Insurance Corp. Please refer to the Certificate of Insurance for a complete list of covered procedures. Need a customized vision insurance plan?